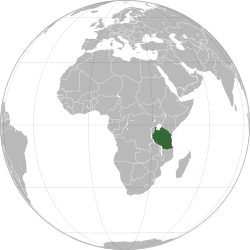 The Unitit Republic o Tanzanie (/[unsupported input]ˌtænzəˈniːə/ Swahili: Jamhuri ya Muungano wa Tanzania) is a kintra in central East Africae bordered bi Kenyae an Uganda tae the north, Rwanda, Burundi an the Democratic Republic o the Congo tae the wast, an Zambie, Malawi an Mozambique tae the sooth. The kintra's eastren borders lie on the Indian Ocean. 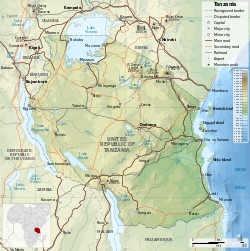 The Unitit Republic o Tanzanie is a unitary republic composed o 26 mikoa (regions). The heid o state is Preses Jakaya Mrisho Kikwete, electit in 2005. Syne 1996, the offeecial caipital o Tanzanie haes been Dodoma, whaur parliament an some govrenment offices are locatit. Atween unthirldom an 1996, the major coastal ceety o Dar es Salaam served as the kintra's poleetical caipital. The day, Dar es Salaam remains the principal commercial ceety o Tanzanie an the de-facto seat o maist govrenment institutions. It is the major seaport for the kintra an its landlockit neighbours. The name Tanzanie derives frae the names o the twa states Tanganyika an Zanzibar that unitit in 1964 tae form the Unitit Republic o Tanganyika an Zanzibar, which later the same year wis renamed the Unitit Republic o Tanzania. ↑ +007 frae Kenyae an Uganda. ↑ 1.0 1.1 "Tanzania". Ethnologue. SIL International. ↑ "About the United Republic of Tanzania". Permanent Representative o Tanzanie tae the Unitit Naitions. Archived frae the oreeginal on 19 February 2011. Retrieved 31 January 2015. ↑ Tanzania. Dictionary.com. Dictionary.com Unabridged (v 1.1). Random House, Inc. http://dictionary.reference.com/browse/tanzania (accessed: 27 March 2007). This approximates the Swahili pronunciation [tanzaˈni.a]. However, /tænˈzeɪniə/ is also heard in English. ↑ 13.0 13.1 Central Intelligence Agency (2009). "Tanzania". The World Factbook. Retrieved January 25, 2010. ↑ "The Tanzania National Website". Tanzania.go.tz. Archived frae the oreeginal on 2012-05-29. Retrieved 2010-05-01. ↑ "The Tanzania National Website: Country Profile". Tanzania.go.tz. Archived frae the oreeginal on 2012-05-29. Retrieved 2010-05-01. Wikimedia Commons haes media relatit tae Tanzania. This page wis last eeditit on 20 Februar 2019, at 23:24.